Hi everyone! I'm really excited about todays blog post as i've tried a superb tea from Whittard of Chelsea. You may know Whittard as a high street shop that's been selling tea, coffee, hot chocolate and china since 1886. There's now 74 UK stores as well as an online shop, both of which you can find the lovely products i'm blogging about today, which is "Sencha Green Tea with Mango and Bergamot" and a really cute polkadot teacup and saucer! 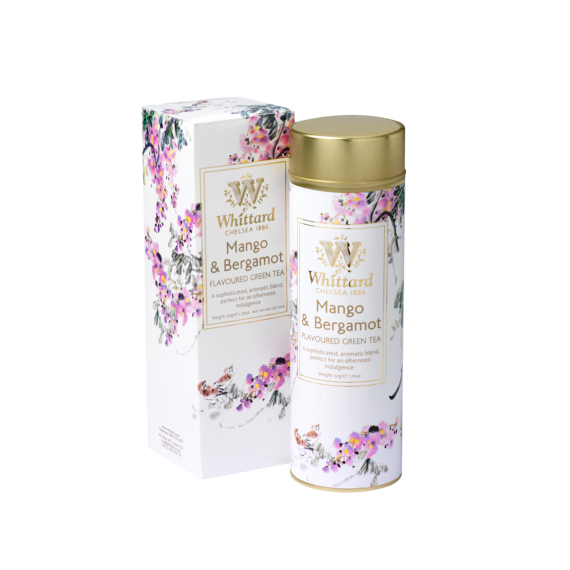 The mango and bergamot green tea comes in a tin and box that's very luxurious-looking and feels like a box of perfume. However, when I opened the tin I saw - and smelt, that it was more than just fancy packaging. I absolutely LOVE the sweet aroma off these flavoured leaves and look how pretty the colours are! This Whittard polkadot teacup, isn't what i'd usually go for (remember my blingy Fortnum and Mason China teacups?) but i've fallen in love with it as it goes really well at home and looks kind of rustic chic. It's also really easy to look after, being microwave and dishwasher safe. I think I may have to buy the matching teapot to finish the tea-time look! Onto the the brew: You may be thinking that the bergamot flavouring would make it more of an Earl Grey tea, but surprisingly it doesn't taste like Earl Grey at all (love or hate it) as it's not an overpowering flavour. I'd say the mango is the main flavour, making it luxuriously sweet and the tea base tastes a little more like a light black tea than a typical (sometimes bitter) green tea. So if you're a black tea drinker, don't be put off about the green tea as it still tastes like 'tea'. I felt comforted and relaxed after my tea-time and thought the tea was very refreshing and perfect for Spring! 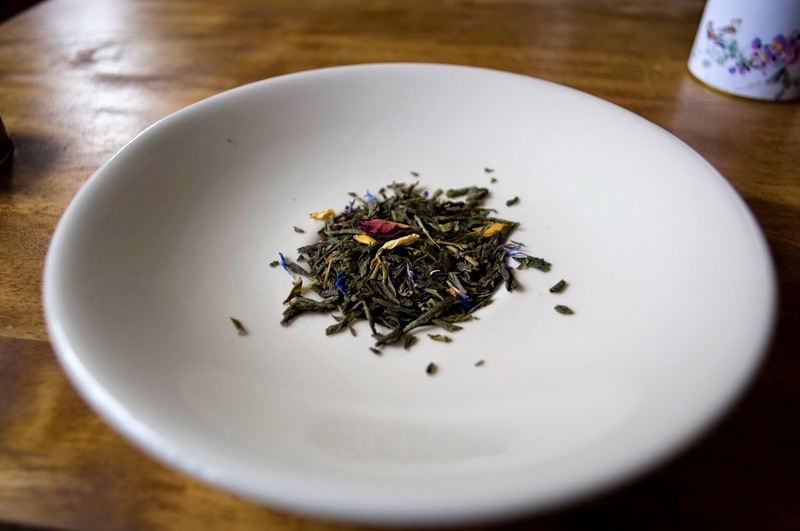 The mango and bergamot green loose tea was (not surprisingly) a 'Great Taste Award' winner in 2013 and 2014, and the 50g box is priced at £10.00. This lovely teacup is priced at £8.00 and both in my opinion are fairly affordable for a treat for yourself or as a gift for someone. OFFER TIME!! Whittard is doing an offer to promote their new Alice in Wonderland range.. 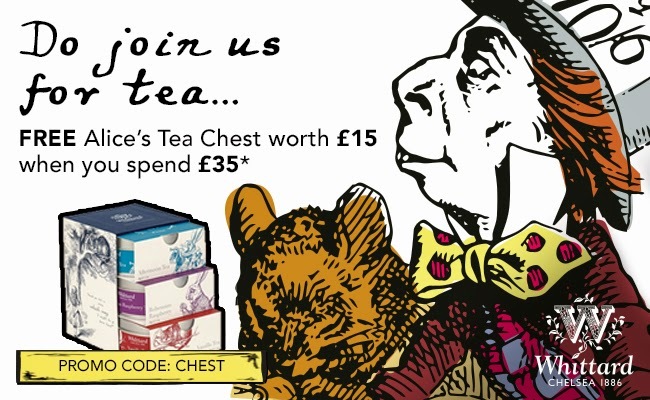 It's a FREE Alice's Tea Chest when you spend £35.00 online by putting the online code CHEST into your shopping basket. The offer ends on the 5th april 2015 so be quick!